Including great ancient mathematicians, e.g. Euclid, Archimedes, Zeno, etc. This project is about the evolution of increasingly complex and varied information-processing mechanisms operating on increasingly complex and varied forms of information in increasingly complex and varied living organisms, as a result of still unknown processes that began in a lifeless universe billions of years ago. What features of that lifeless universe made possible a collection of increasingly complex boot-strapping processes that produced not only a huge variety of physical forms of life, but also the still largely uncharted variety of types of information, and information-using mechanisms that made those life forms possible? How can the huge diversity of life forms, with increasingly complex and varied combinations of physical forms, behavioural capabilities, habitats, types of information and information-processing machinery (including virtual rather than physical machinery) be encompassed in an integrated theory, which includes both descriptions and explanations of the details and explanations of how the details are constantly being extended, over time in the life of each individual, and over generations within (branching) species? Many (most?) philosophies of learning and science assume there's a fixed type of world to be understood by a learner or a community of scientists, using fixed, general-purpose learning and discovery mechanisms, e.g. discovery of sometimes co-occurring features, and derivation of probabilities of co-occurrence. In contrast, biological evolution, in collaboration with its products, is metaphysically creative, and constantly extends the mathematical diversity and complexity of the world to be understood, including constantly extending the types of learners with new powers, whose actions and, the products of their actions, contribute to extending what needs to be learnt by new members of the species. At first this happens mainly by change of environment and/or evolution of new species, leading to new genome/environment interactions expressed in individual behaviours that differ across generations. In more advanced (late-evolved) learners, a multi-stage/multi-layered genome can extend the powers of each learner in different ways at different stages during epigenesis -- producing creative, self-modifying, developmental trajectories influenced by both the (possibly unique, or dynamically changing) local environment and also the epigenetic stage reached by the individual -- just as ancient genomes produced chemistry-based construction-kits for building different body parts at different stages of development, and different control mechanisms for producing different internal or external processes at different times. 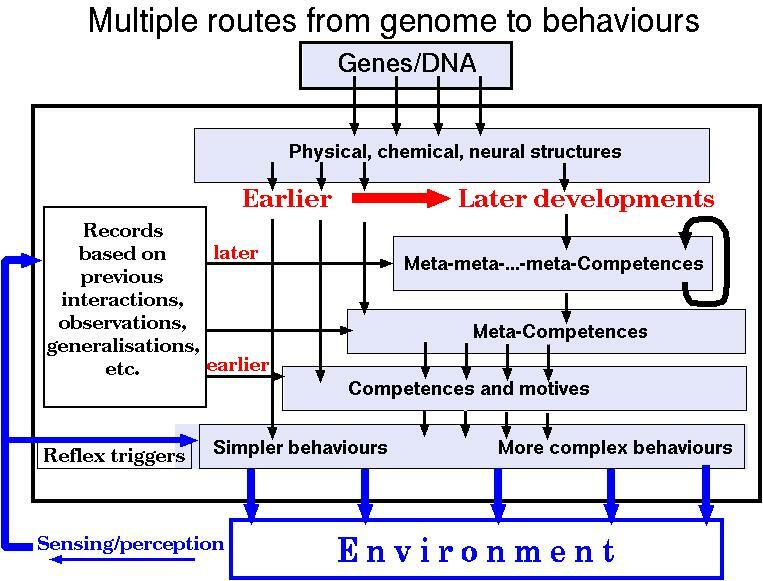 Layered/staggered gene expression allows the same (or approximately the same) genome to produce very different developmental trajectories in different individuals or in different environments -- with resulting differences in physical development, behaviours, forms of learning, and individual actions on the environment. (c) new forms of gene-expression produced by interaction of later gene-expression with products of (a) and (b) . As a result, the gene-expression processes within a species can differ across co-existing individuals, with slightly different environments, and also across generations, across geographical locations, and across cultures, changing dramatically under the influence of new technology produced by the species, as humans demonstrate so clearly. There were earlier "less creative" stages of the species where individual or group actions could not have such dramatic effects on gene expression -- e.g. ancient humans with relatively unchanging environments and cultures. For humans, especially those alive during and after the last few decades of the 20th century, the rate of production of new technology, with costs for users going down while powers and applications increase, and geographical availability accelerates, has produced unprecedented rates of change in what individuals can do, and thereby altered much of what they want to do. Despite vast amounts of research, much is still unknown, including key features of the evolved biological mechanisms that underly many varieties of spatial reasoning in human and non-human species, including the mechanisms in human brains and minds, partly shared with other intelligent species, which, in humans, produced minds of ancient mathematicians whose discoveries laid foundations for much of what followed, using information processing mechanisms that (I claim) are not yet understood and not yet replicated in machines. One of the key explanatory ideas, developed in collaboration with Jackie Chappell (Birmingham, Biosciences), is that evolution "discovered" the power of what we call "meta-configured" genomes -- relatively late products of biological evolution. in a universe with very deep and rich mathematical generative powers, expressed at different stages during individual development, as explained below. One (unobvious) consequence is that besides including deep mathematical structures, the physical universe includes mechanisms that can be combined to form organisms capable of making increasingly complex mathematical discoveries and and creating or trying to create instances of new mathematical structures. Such evolutionary mechanisms also require deep mathematical features that have proved hard to understand and to replicate in Artificial Intelligence -- perhaps because they make essential use of sub-neural, chemical, information processes that make essential use of a mixture of discrete and continuous processes that cannot all be replicated on digital computers (including Turing machines). This project began late in 2011 -- as an invited chapter published in in 2013 in part IV of the award winning Elsevier Turing Centenary volume. Since then, the project (like this document) has been revised, expanded and split into sub-projects several times. An important sub-theme discusses the essential roles of "Construction Kits" (fundamental and derived, concrete and abstract) used by and (mostly) created by biological evolution. organised by the Birmingham https://twitter.com/FraMEPhys project and the Gothenburg Metaphysical Explanation project. These notes Sloman(2019), summarise the links between the Meta-Morphogenesis project and Metaphysics, pointing out deep connections between biological evolution's discoveries, including its creative use of mathematics, and the metaphysical status of mathematical truths. What's the connection with Turing? Less direct evidence is provided by asking: Why did Turing produce a major piece of work on chemical morphogenesis, Turing(1952), two years before he died, and what might he have done if he had lived several decades after that? My tentative answer is that he would have explored the potential for chemistry based information processing, using a mixture of discrete and continuous machinery with features highlighted as crucial for biological reproduction and evolution by Erwin Schrödinger: (1944). A key assumption here is that the core concept of information is not concerned with communication, storage and retrieval of information, but with various uses of information, e.g. in taking decisions, making and using plans, controlling behaviour at various levels of abstraction, formulating questions, recording acquired knowledge, deriving consequences, formulating explanations and predictions, reflection on implications of recently recorded information, and many more. This point is expanded below. "In regard to understanding the physical world, we are in much the same position as Eratosthenes was in regard to the Earth: he could measure it remarkably accurately, and he knew a great deal about certain aspects of it - immensely more than his ancestors had known only a few centuries before. He must have known about such things as seasons in regions of the Earth about which he had no evidence. But he also knew that most of what was out there was far beyond his theoretical knowledge as well as his physical reach. We cannot yet measure the universe as accurately as Eratosthenes measured the Earth. And we, too, know how ignorant we are. For instance, we know from universality that AI is attainable by writing computer programs, but we have no idea how to write (or evolve) the right one. We do not know what qualia are or how creativity works, despite having working examples of qualia and creativity inside all of us. We learned the genetic code decades ago, but have no idea why it has the reach that it has. We know that both of the deepest prevailing theories in physics must be false. We know that people are of fundamental significance, but we do not know whether we are among those people: we may fail, or give up, and intelligences originating elsewhere in the universe may be the beginning of infinity. And so on for all the problems I have mentioned and many more." But do we really know that (human-like, or squirrel-like) AI is attainable on digital computers? We do know that human brains include vast numbers of molecular (e.g. chemical) processes combining discreteness (e.g. catalytic reactions), continuity (folding, twisting, moving closer or further), enormous parallelism, and (quantum) randomness. Could any single, sequential Turing machine, with its discrete tape and discrete collection of symbols and discrete, deterministic, machine table, model such a brain precisely? The investigations reported in this project suggest not. John von Neumann raised related doubts in 1958. Compare Newport(2015). Even Alan Turing, in his 1938 PhD thesis, mentioned above, distinguished roles for intuition and ingenuity in mathematics, suggesting that computers can provide only the latter. What brain mechanisms are needed to provide mathematical intuition, and whether they can be replicated artificially is an open question discussed in various parts of this web site. My own interest in these questions began with my attempt to defend Immanuel Kant's philosophy of mathematics in my 1962 DPhil thesis, written before I knew anything about computers or AI. .... "if you actually want to build something that will compute in a different way, you have to start by looking at physics: find something with a behavior fundamentally different from the sequential deterministic stuff used to construct current computers, and then come up with a way to use that new thing to do useful computations for you." I suspect that shortly before he died, Alan Turing was beginning, in his 1952 paper, to explore an alternative based on the combination of continuity, discreteness, and unsynchronised parallelism found in chemical reactions, previously noticed by Schrödinger in What is life? (1944). This project is my pathetic attempt to guess at some of what Turing might have achieved, had he lived a few decades longer. I think Turing was not committed to the strongest form of what is now (misleadingly) called the "generalised" Church-Turing thesis. Early evidence for this disagreement is in his 1938 distinction between intuition and ingenuity, summarised and discussed in the paper referenced above. Including a section on links to related projects (added 19 Dec 2014). 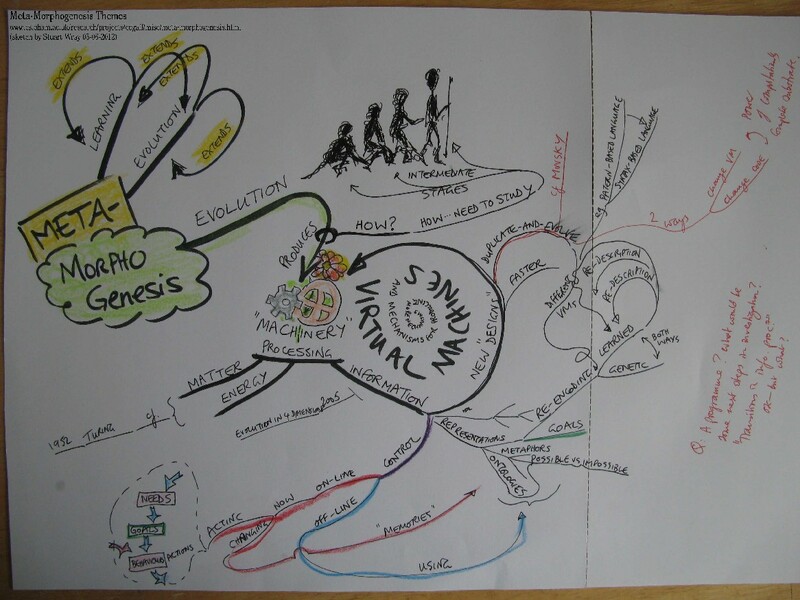 Stuart Wray's sketch of aspects of meta-morphogenesis. NOTE added 12 Mar 2015: A different answer by Andrew Hodges. BACKGROUND: How did this project start? Meta-morphogenesis: a more detailed overview. REQUIREMENTS for organisms and their components can also evolve. Philip Warren Anderson "More is different"
Do we know enough about information and computation? Are babies born with empty minds plus a learning machine? The main question: How could all life, and products of life, on Earth come out of a cloud of dust that converged to form a planet? Evolved information-processing -- in animals and machines. Constant extension of what needs to be explained by science. A number of distinct, but intricately related, themes can be found in this project, although this feature was not planned when the project started. Closely related questions about biological evolution, listed below, need to be distinguished. The standard Darwin-Wallace theory of evolution by natural selection, as normally understood, addresses only Question 2(b), attempting to explain how evolution "chooses" between available options. This implicitly assumes that there is an answer to Question 2(a), which asks what makes those options possible. Questions about what sorts of things are possible and what makes them possible are the deepest questions in science, as explained below. Q.1 What makes various evolutionary or developmental trajectories possible? There is a huge branching space of possible evolutionary trajectories, only a subset of which are realised at any region of space-time: only a subset of physically possible trajectories become actual trajectories. Each subset spawns new branching possible trajectories --- different subsets in different parts of the universe at different times --- and only a subset of those will actually be realised. A deep theory of biological evolution should explain all the possible trajectories, not merely those that are actualised. What features of the universe make that whole branching space possible? Q.2(a) What makes new branches possible at different space/time regions of the universe? Q.2(b) What causes various subsets of those possibilities to be realised in actual evolution (e.g. at different times and different places, or in different individuals, or in the same individual at different stages of development)? I suspect the answer to Q.3 will help us understand why developments in AI so far fail to model or emulate important aspects of human and animal intelligence, including understanding how great mathematical minds made major discoveries long before the development of modern mathematics based on "formal" mechanisms e.g. logic, algebra, set theory, etc. Many of the ancient mathematical discoveries revealed geometrical impossibilities and necessary connections between possibilities, whereas current neural theories focus on probabilities. Current theories of brain function do not explain abilities to represent necessity and impossibility, although the brains of ancient mathematicians (e.g. Archimedes, Euclid, and many others) clearly used such abilities (as do brains of squirrels and other intelligent non-humans, though they lack the meta-cognitive mechanisms required to reflect on their competences and discuss them). Requirements for such a type of mechanism are being explored here: A Super-Turing Membrane Machine for Geometers (but there's much more detailed work to be done). Q.4 What features of the fundamental construction kit made all the rest, including derived construction kits, possible? How? Are important kinds of construction kit possible that have not yet come into existence? Q.5 How are derived construction kits produced by evolution, and how do they change subsequent evolution? Q.6(a) What sorts of mathematics are required to describe and explain the operation of these construction kits, and their powers and limitations? Q.6(b) What sorts of information processing mechanism (discrete? continuously variable? deterministic? stochastic?) allowed brains to acquire and manipulate spatial (topological/geometric) information in ways that eventually led to the discoveries of ancient mathematicians, including axioms, constructions and theorems in Euclid's Elements? Q.7 In what ways was evolution a "blind mathematician" using increasingly complex mathematical features of the universe and deriving new mathematical features? From this standpoint the creativity of evolution exceeds all other known forms of creativity. (Q.4-Q.7 made explicit here: 27 Dec 2017, Q.2 revised 5 Feb 2018. Different answers to the first question limit in different ways what can be explained by answers to the second. The third question considers extensions to the answers to both questions, which I suspect Turing might have worked on if he had lived longer. The first and third questions are the main topic of the Meta-Morphogenesis project. The second question is the one most theories of biological evolution since Darwin focus on. An assumption that pervades all of this is that a scientific understanding of the universe will need to treat at least matter, energy and information as fundamental aspects or constituents of the universe, none of which can be studied independently of the others. The three concepts cannot be given explicit definitions: they can be explicated only in ever expanding theories about their mutual relationships (e.g. information can control how available energy is used in the behaviours of material things; matter is required for storage of energy and information, all changes in states of matter and information require energy). "Mathematical reasoning may be regarded rather schematically as the exercise of a combination of two faculties, which we may call intuition and ingenuity. The activity of the intuition consists in making spontaneous judgments which are not the result of conscious trains of reasoning. These judgments are often but by no means invariably correct. . . . The exercise of ingenuity in mathematics consists in aiding the intuition through suitable arrangements of propositions, and perhaps geometrical figures or drawings." But that assumes a connection between his thinking in the late 1930s and his thinking around 1950 for which I have no direct evidence. Einstein showed how matter and energy are ultimately the same thing. Information seems to be something different. Information can be used to take control decisions. It can be used to specify goals to be achieved, dangers to be avoided, methods and resources available, preferences between options, requirements for new features of a machine, designs for things that meet the requirements, and many more. Unlike mass-energy, information does not seem to be conserved, as shown by the ever-increasing variety and power of new kinds of information produced by biological evolution and its products -- using increasingly complex construction kits produced by evolution, combining matter, energy and information. As the amount of information acquired increases, physical matter in living organisms becomes more organised, including matter used to specify the organisation. So entropy decreases in the relevant part of the universe. However that need not conflict with the law of increasing entropy if there are external sources of energy, e.g. including solar radiation and various forms of energy stored in the planet producing earthquakes, volcanoes, tides and other less dramatic, but biologically important effects. Entropy decrease in some parts is compensated for my entropy increase in others. If a mostly flat tray with many marbles has a collection of deep but narrow depressions (i.e. tubes sealed at the bottom), then if the tray is held horizontal and shaken randomly in a horizontal plane more and more marbles will fall into the tubes, decreasing the randomness of the configuration. Getting the marbles out onto the tray will require carefully deployed energy. An increasingly large and important subset of evolved construction kits are concerned with information-processing: i.e. acquisition, transformation, storage, combination, analysis, transmission, and above all use of information. The earliest uses must have been for simple control functions in the most primitive organisms, e.g. binary decisions, such as whether to move or not, or whether to allow a molecule to pass through a membrane, or homeostatic control, e.g. maintaining temperature. There's more detail on evolved construction kits in Sloman(C-K) especially the crucial role of construction kits for building new kinds of information processing mechanism. Over time, and across many evolutionary steps and generations, information is used for increasingly varied functions, now including asking questions about evolution. This is reflected in a new alternative title for this project: The self-informing universe. Perhaps future science will extend these ideas to fuse the concepts of matter, energy and information in something like the way Einstein's theory of General Relativity fused matter and energy. There's more on this triad below. We need all three to understand what life is and how it evolves -- in a way that produces increasingly sophisticated information-processing machines: minds of many kinds! However, this concept of information is NOT Shannon-information, but Jane Austen's concept of information. Shannon was concerned with mathematical properties of information bearers, which he unfortunately labelled "information", thereby confusing a whole generation of researchers, though Shannon was not confused, as he was aware of the difference, explained in the discussion of Jane Austen's concept of information, below. This introduction focuses mainly on how Q.1 has been ignored by many who support the theory of evolution by natural selection. Later sections will mention Evo-Devo problems relevant to Q2 (a and b) and Q.3. Originally, the focus of this project was mainly on Q.2 and Q.3 -- the search for important unnoticed transitions in information processing in evolution of biological organisms, transitions whose discovery could give us clues regarding unexplained powers of humans and other animals, e.g. the ability to make mathematical discoveries of the sorts reported in Euclid's Elements over 2 thousand years ago. If anyone produces a revised or rival sketch I would be grateful for a copy! Since Darwin, the standard answer given by scientists (and many philosophers) to Q.1 and Q.2 (above) is "natural selection": instances of alternative designs compete, and some survive and produce offspring, while others do not -- a process that repeatedly produces more complex and more diverse organisms via branching (and sometimes merging) evolutionary trajectories. What makes it possible for the increasingly complex products of increasingly complex and varied physical mechanisms to come into existence and function in an enormous variety of physical life forms, with new forms regularly emerging? "Living complexity cannot be explained except through selection and does not require any other category of explanation whatsoever." ignoring the need to explain what makes both the successful and the unsuccessful evolutionary transitions possible candidates for selection. A successful explanation should also account for possibilities that have not been and never will be realised, because the right conditions do not exist, although they are physically possible. Since the discovery of mechanisms encoding genetic information in DNA, I have the impression that at least some of the researchers who take Q.1 seriously assume that a sufficient answer is provided by postulating mechanisms that produce small random variations in genetic codes. But the possibility of random changes in DNA does not suffice to explain how a planet whose only life forms were single celled organisms could much later produce elephants, giant redwood trees, magpies, and mathematicians like Euclid. Compare someone from another country or another planet asking how pressing buttons on a hot drinks dispenser makes different drinks come out of a spout. Answering that there are selection buttons that specify the desired drink leaves out most of the explanation. An answer to the question about how evolution produces so many new species over a long time period should also explain the possibilities that were not realised (selected) but might have been realised in different circumstances. Just as a deep theory of planetary motion (e.g. Newton's) must explain far more possible trajectories than observed trajectories, a deep theory of biological evolution should explain far more possible products of evolution than observed products. Chomsky 1965 made similar points about the need for "generative" explanations of possible utterances in a language. "So I think that to explain these developments in terms of the properties of cell and developmental systems will unify biology into a set of common principles that can be applied to different systems rather than a number of special cases that have to be learned somehow by rote." This seems to be consistent with the theory of evolved construction kits being developed as part of the M-M project. I shall later try to write something about the connections, and will add links on this site. But such "standard" answers do not explain what makes those rival life forms possible: it is just assumed that somehow they come into existence and when there is competition for resources some forms are better able to obtain resources, thereby depriving the alternative forms, so that they die away. But that doesn't explain what is it about our universe that makes all those enormously varied life forms possible -- along with others that might have evolved but did not, since the processes are random? This question was taken seriously by Erwin Schrödinger: (1944), who provided a partial answer, as explained below. At this stage some readers may be reminded of theoretical biologists, e.g. Brian Goodwin, who have emphasised "laws of form" rather than genes. I am not aware of any version of that theory that has sufficient explanatory power, but it can be considered a step in the right direction. Deep explanatory theories must have deep explanatory powers. The important role in science of explanations of possibilities (as opposed to regularities/laws) was discussed in Chapter 2 of Sloman (1978) (expanded slightly in the latest edition), but is not yet widely understood. For example, it contradicts Popper's claim (modified in his later work) that good scientific theories must be falsifiable empirically. A loose analogy may help to clarify what I am saying. If people are observed playing a game, someone watching might want to know (1) what moves are possible according to the rules of the game and the capabilities of the players, and which impossible, either because of the rules of the game or limitations of the players or aspects of the environment. The observers may also wish to know (2) how the players choose among the possibilities. The answers to (1) could refer to different sorts of enabling and constraining factors, including rules of the game and capabilities of the players. The answers to (2) could refer to mechanisms that operate within the possibilities and constraints, including both mechanisms for selecting between possibilities and mechanisms for realising and deploying the selections. Since Darwin, evolutionary biology has made great strides in elaborating answers both to Q.2 and to some aspects of Q.1, although most methodological discussion of evolutionary explanations tends to focus on which among competing lineages wins the battle for resources, often without explaining what mechanisms make the competing lineages possible, leaving Q.1 unanswered. Q.3 is usually not even considered, in my experience. Most of the progress on Q.1 is concerned with mechanisms related to physical forms and physiological processes. Evolution of mechanisms required for information processing capabilities (e.g. perception, learning, reasoning, explaining, development of new concepts, etc.) has received much less attention. This may in part be explained by the enormous difficulty of the task (partly because information processing mechanisms do not generally leave fossil records) and in part by the fact that most scientists (including most psychologists and neuroscientists) receive a very shallow education regarding information processing mechanisms -- most (but not all) merely learn to use a small subset of tools designed by others, especially tools for analysing and evaluating research data rather than tools for designing and testing explanatory mechanisms, e.g. visual mechanisms, mathematical reasoning mechanisms, and mechanisms required for use of human languages. So the researchers do not acquire deep competences in what was referred to as "Computational Thinking" in Wing (2006) (echoing older ideas of Alan Kay, Seymour Papert and Marvin Minsky). Unfortunately, current dramatic changes in computing education do not seem to be addressing this gap, since they focus mainly on practical uses of computers, or uses for entertainment, not deep scientific explanatory uses. The current state of the art in the science and engineering of information processing systems is still not up to the task. As far as I know, no existing scientist (or engineer) could design a working brain for a robot that interacts with its environment as a human toddler, or a monkey, squirrel or crow does and also develops new information processing competences as they do. Answering that aspect of Q.1 remains a deep challenge. Soon after I started learning AI programming around 1970 I set myself the goal of working out how to design a "baby robot" that could grow up to be a mathematician able to make discoveries in Euclidean geometry, hoping to test some of the ideas about mathematical knowledge in Kant(1781), whose views I had defended in my 1962 DPhil thesis, before I knew anything about AI. Nearly half a century later no AI researcher that I know of is even close, and the reasons for lack of progress are far from obvious. My main motivation for the Meta-Morphogenesis project is the hope of getting important clues about what is missing by studying previously unnoticed aspects of evolution of biological information processing systems, that provide deep new answers to Q.1 (What makes various evolutionary or developmental trajectories possible?) Many researchers just assume, like Graham Bell, quoted above, that new designs are somehow produced by biological mechanisms and inferior ones eliminated by competition for resources. In contrast, a key idea in the M-M Project (partly inspired by Turing's work on morphogenesis [Turing-52]) is that Q.1 needs an answer, and a key part of the answer, developed in a separate paper Sloman(C-K), is that the physical universe supports a wide variety of construction kits derived from a "fundamental" construction kit (FCK) provided by physics and chemistry, or possibly some deeper but still unknown physical mechanisms underlying physics and chemistry. The hope is that the theory of fundamental and derived construction kits will unify physics, chemistry, biology, and eventually also AI, neuroscience, psychology and philosophy, providing new answers to many old philosophical questions about the nature of life and mind (including the powers of mathematical minds). While Q.1 remains unanswered, evolution of animal intelligence, including human intelligence, remains unexplained: the Darwinian answer in terms of reproductive fitness does not explain what makes the observed kinds of animal intelligence possible. It merely explains how IF intelligent species evolve THEN they are more likely than less intelligent competitors to survive in environments where intelligence is useful. Of course less intelligent species with which they are not in competition may also survive, e.g. microbes, insects, plants of many kinds, etc. I suggest (partly inspired by Turing's work on morphogenesis [Turing-52]) that Q.1 needs an answer, and a key part of the answer, sketched but with many remaining gaps, in a separate paper Sloman(C-K), is that the physical universe supports a wide variety of "construction kits" derived from a "fundamental" construction kit (FCK) provided by physics and chemistry, or possibly some deeper but still unknown physical mechanisms underlying physics and chemistry. Some of the construction kits are concrete, others abstract, especially construction kits for building information processing systems, as illustrated by the ever-expanding uses of virtual machinery in computer based systems over the last half century -- a transition whose biological relevance has mostly gone unnoticed. The M-M project was launched (in 2012, unfunded) in the hope that by investigating previously unstudied evolutionary transitions we may gain clues regarding forms and mechanisms of information processing that we have not stumbled across in psychology, neuroscience, computer science, software engineering or Artificial Intelligence, including some that will provide clues as to mechanisms required for replication of mathematical competences that made possible the discoveries organised in Euclid's Elements, and related competences in human toddlers and other animals that we cannot yet explain or replicate. The label for the project "Meta-Morphogenesis" was based on the observation (which could not have escaped Alan Turing) that many of the products of evolution (a form of morphogenesis) alter the mechanisms of evolution, partly by altering the opportunities and tasks faced by products of evolution. A simple example is the evolution of sexual reproduction, which was not possible in the earliest (unicellular) life forms. A more subtle example is the evolution of mate selection making use of previously evolved cognitive mechanisms that allow possible mates to be compared and evaluated, modifying the selection processes and thereby the course of evolution (sometimes in bizarre ways). There are also many ways in which evolution of one species can affect evolution of another, e.g. when one species uses another for dispersal of its seeds. More generally, evolution of certain cognitive powers enabled formation of cultures and evolution of cultures, which in turn could influence natural selection. A possible result that has not, as far as I know, occurred might be evolution of tendencies towards religious belief that in some societies might lead to oppression of those who lack the tendencies, including preventing them from producing offspring. This might lead to a culture dominated by individuals genetically disposed to superstitious beliefs (if such a thing is biologically possible). Products of evolution include not only new species, and new variants of old species, but also new construction-kits: "derived" construction kits (DCKs). Some of them are concerned only with uses of physics and chemistry to create new physical/chemical structures (e.g. muscles, skeletons and exoskeletons), whereas others are used to create new information-processing mechanisms, serving increasingly complex functions as evolved organisms became more intelligent. Each construction kit provides materials and mechanisms that support a particular branching space of possible sequences of assembly steps, where each step both consumes resources, thereby limiting future possibilities and also supports new possibilities by combining old mechanisms to create new structures and mechanisms that can also be combined. In some cases temporary structures (e.g. scaffolds or tools) are produced that allow new assembly processes to occur, after which the temporary structures are discarded or disassembled. Disassembly can open up further new branches based on re-use of discarded parts. Of particular importance for biology are the increasingly complex new construction kits for building increasingly sophisticated information-processing systems (eventually including human minds). Readers who have had experience "playing" with construction-kits such as Meccano, Tinker Toys, Fischertechnik, plasticine, sand, paper and scissors, etc. may have the advantage of finding it easy to think about a universe providing a fundamental construction kit from which everything else in the universe is built. These ideas can be elaborated in ways that many will find surprising. Unlike familiar "toy" construction kits, the fundamental construction kit provided by the physical universe somehow continually produces increasingly complex and varied construction kits that grow out of previously evolved construction kits (as discussed in more detail in a separate paper Sloman(C-K)). Unlike many physical/chemical processes in which patterns form, interact, and change, evolutionary processes make essential use of information, e.g. genetic information specifying and controlling the construction of new offspring and acquired perceptual information used in selecting and carrying out increasingly complex actions. As evolution produced organisms with more varied and complex developmental and behavioural competences, they needed to use information to choose between competences to use at various stages of development and when acting in complex environments. The types of information, uses of information, forms of information representation, and mechanisms of information processing became increasingly complex and varied over time. The crucial fact about information is that it is used in control processes, including control of reproduction, development, interaction with the environment, mating, social interaction, and collaborative constructions. Since reproduction and evolution make essential use of information, this meant that the mechanisms of reproduction and evolution could be changed by evolution. Hence the label "meta-morphogenesis". Unfortunately, the study of evolved forms of information and mechanisms of information-processing can be much harder than the study of evolved physical forms and physical behaviours, which leave fossil records, tools, and other artefacts. Was Turing thinking along these lines when he died? As Turing seems to have realised: the forms of information-processing used by evolution were richer and more varied than those developed by computer scientists and engineers so far, and made essential use of chemistry. are at least as important as electrical"
That comment is almost universally ignored, though it occurred in one of his most widely cited papers. Re-reading it in 2011 led me to wonder, especially in the context of trying to write some comments on his 1952 paper, whether he had thought about the significance of chemistry for evolution of information processing mechanisms rich enough to support minds in a physical universe. Two years after that he was dead. What would he have done if he had lived several more decades? In 1946 Turing wrote a letter urging W. Ross Ashby to use Turing's ACE computer to implement his ideas about modelling brains. He expressed a view that is unfashionable among AI researchers at present (2016), but accords with the aims of this project. "In working on the ACE I am more interested in the possibility of producing models of the actions of the brain than in the practical applications to computing." Trying to understand the many steps in evolution of increasingly complex biological information-processing systems: including molecules, microbes, mastodons, magpies and mathematicians. This could lead to discovery of previously unnoticed mechanisms in biological brains and minds that explain the many discrepancies between animal intelligence and current AI, and perhaps also explain how new forms of intelligence not yet produced by natural selection are possible even though biological evolution has not yet stumbled across them. A different answer to the question about Turing, by Andrew Hodges. What would Alan Turing have done after 1954? This project resulted from a miscommunication in 2011 with Barry Cooper, who had asked me to contribute to a book he was co-editing, on Alan Turing's life and work, eventually published in 2013, the year after Turing's centenary: Cooper and van Leeuwen, (2013) (winning several awards). Further information about the book and a full table of contents can be found here: http://www.cs.bham.ac.uk/~axs/amtbook/. This document started as a description of my contribution to that book, especially my paper in Part IV, proposing the Meta-Morphogenesis project. That project later spawned a paper on fundamental and evolved construction kits, mentioned below. Alas, I learnt in November 2015, that Barry had died unexpectedly after a very short illness. At that time he and Mariya Soskova were in the process of editing a Book The Incomputable, to be published by Springer, to which he had invited me to contribute another paper extending the 2011 paper defining the M-M project. The new paper is on the crucial roles of various sorts of construction kit in biological evolution. A version of that paper frozen in 2016, was published in 2017 as an invited contribution to Cooper and Soskova(2017). A revised, extended, still growing, version of that paper is also available Sloman(C-K). After some discussion about how best I could contribute, which involved a change of plan mid-way, I sent him my promised three related short chapters, the first for Part I, of the book (How Do We Compute? What Can We Prove?) and the others for Part III (Building a Brain: Intelligent Machines, Practice and Theory). That triggered questions about what Turing might have done if he had lived another 30-40 years, instead of only two. My speculative answer to that question identified the Meta-Morphogenesis (M-M) project, so-named because biological evolution is a process of morphogenesis that modifies the mechanisms of morphogenesis. The key focus of the M-M project is on changes in information processing mechanisms produced by biological evolution. I conjecture that there remain important mechanisms that have not been discovered and which are essential for understanding and replicating important brain functions in humans and other animals, especially those concerned with making mathematical discoveries. So I offered Barry a short paper proposing "The Meta-Morphogenesis Project" as a conjectured answer to my hypothetical question about Turing, written in 2011, published as Sloman(2013). He accepted it (as the final commentary paper in the book) and ever since then I have been working full-time on the project, for which this page is the main entry point, from which many sub-projects have been launched. Barry later invited me to talk to a workshop at the Royal Society Kavli Centre in June 2012, followed by an invitation to talk to the Logic Seminar in Leeds in October, and then in 2013 invited me to contribute to a book The Incomputable, to be published by Springer, being co-edited by Barry and Mariya Soskova, mentioned above. Some of the construction kits are concrete e.g. mechanisms for building components of tree trunks, while others are abstract, e.g. construction kits for reasoning mechanisms implemented as virtual machines. An earlier version frozen mid 2016. was included in the new volume, published in 2017. I also met Barry a few times at workshops or conferences, and I always immensely enjoyed and benefited from our discussions. Originally stimulated by Barry's requests and enormously encouraged by his responses to my drafts, I now expect to go on working on these problems as long as I can. I am very sad that we'll not be able to have any more conversations. "I see no other escape from this dilemma (lest our true aim be lost forever) than that some of us should venture to embark on a synthesis of facts and theories, albeit with second hand and incomplete knowledge of some of them - and at the risk of making fools of ourselves. So much for my apology." I do not intend to apply for any funds for this project. Others may, if they wish. many branching layers of increasingly complex physical/chemical structure and mechanism -- different types in different parts of the universe. many branching layers of information-processing machinery, required for new forms of control, new forms of reproduction, new forms of development, new forms of intelligence, new forms of social/cultural evolution, continually producing and using new types of concrete and abstract "derived" construction kit. It is widely assumed that information is essentially something to be transmitted from a sender to a receiver, though for various reasons it may also need to be stored, transformed, or combined with other information. But being stored and being transmitted cannot be the most important processes and states involving information, since information is acquired, stored, transmitted and received because it can be used. I previously thought that Gregory Bateson's much quoted but bizarre claim that "information is a difference that makes a difference" is uselessly vague -- perhaps an attempt to draw attention to the fact that the basic type of use of information is for control (making a difference to what happens), and everything else flows from that. Control takes many forms, with many different information contents, and it uses many different sorts of information. New contents, forms, uses, and mechanisms are constantly being found/created by biological processes including development, learning and evolution, including cultural evolution. Storage and transmission are important only because of gaps between when and where information is available and when and where it can be used. The tasks of understanding uses of information, forms of information, storage of information, transmission of information, transformations of information are major themes of this project. The novelist Jane Austen seems to have understood that information is fundamentally something to be used, a century before Shannon's work, as demonstrated below. The study of the uses of information in organisms and machines was of great interest to Turing, and also a major theme of Cyberneticians such as Norbert Wiener, W. Ross Ashby, and W.T. Powers ("Perceptual control theory"). But most such researchers tended to assume that all the mathematical structures and processes could be described in essentially numerical terms, using equations (e.g. including differential equations). That is a disastrous limitation, as shown by the work of linguists, software engineers, architects, mathematicians (especially the pioneering ancient mathematicians whose work was assembled by Euclid, and many others who study mechanisms involving creation and use of non-numerical structures. The "General systems theory" of Bertalanffy may have been an exception to the assumption of numerical information processing, because of his emphasis on structural change and growth: I don't yet know enough about the theory to be sure. In particular, his theory may not have been rich enough to accommodate growth of multi-layered networks of virtual machinery, an idea that came to be understood by engineers and some others, in the last half century, though so far merely scratching the surface -- a topic discussed in connection with Virtual Machine Functionalism (VMF) below. Natural selection repeatedly implicitly discovered and used new types of mathematical abstraction, especially abstractions with non-numerical parameters that could vary in many ways -- long before there were any human mathematicians able to think about mathematical abstractions. Examples included structural parameters (e.g. a grammar, or a biological function, could be a parameter). See also the Multiple Foundations paper. All of this depended on the ability of the Fundamental Construction Kit (FCK) to be capable of producing a (never ending?) branching and merging collection of new, increasingly complex and powerful, derived construction kits (DCKs), with new mathematical properties, some of which are adopted, or created, by new more complex organisms with more complex functionalities, and needs. Not all the derived construction kits used by natural selection are products of natural selection: some are products of non-biological physical, geological, astronomical or cosmic events and processes. Evolution can use effects of volcanoes, tides, seasons, asteroid impacts, and cosmic radiation. Some limiting cases of construction kits may be better thought of as scaffolding: mechanisms and structures that are used temporarily in production of new mechanisms and structures -- like diggers, cranes, computers, information stores (including plans) and workers -- used during construction of a sky-scraper, but not in the finished product. Compare the chrysalis/pupal stages in some insect forms and the placenta in mammals. Since 2011, several different (partly overlapping) themes/sub-projects have emerged. This is a messy, incomplete, inaccurate attempt to "pull out" some of the higher level themes added between 2011 and 2018. with many overlaps, at different levels of abstraction. It will need substantial editing as my thoughts clear and I find time. -- types of internal and external information acquired, stored, used, shared, etc. motivators, preferences, goals, plans, etc. motive selection, motive postponement, meta-management, etc. some current motives, plans, or schedules. increasing discovery and use of powerful re-usable mathematical abstractions. All the above need to be revised, extended, reorganised, pruned, etc. More details are in referenced papers developing these themes. A biological niche is something like a collection of requirements, not a geographical location. The space of possible designs for functioning organisms and the space of possible niches have complex relationships. A change in design for organisms of type T1 can affect changes in niches (sets of requirements) for organisms of type T1, and others T2, T3, etc. Thus there are complex relationships between trajectories in different parts of design space and niche space (see Sloman (1995) and Sloman (2000)). Interacting evolutionary and developmental trajectories of different types on different spatial and temporal scales relate to changes in: whole organisms, parts of organisms, behaviours of organisms, competences of organisms, types of information used, whole species, ecosystems, scaffolding, physical/chemical mechanisms, information-processing mechanisms, and also changes in the requirements for various mechanisms. All of these changes proceed in parallel, with many interactions between them including production of new sets of requirements (new niches). Some of the newly emerging requirements are physical: requirements for new kinds of structure, new kinds of energy store, new forms of locomotion, new kinds of chemical synthesis, new biochemical defence mechanisms, new forms of motion, and many more. Others are new requirements for information processing. For some related ideas see Steve Burbeck's project on life and computation. New kinds of useful information that become available e.g. because of physical changes produced by geological or other physical changes, new ways of acquiring information (e.g. about the environment, or about internal states and processes), or new kinds of information (e.g. information about information), or new ways of storing information or new ways of processing information, and new ways of communicating information. Because many information processing tasks require construction and modification of complex structures with speeds, variety and complexity that could not be achieved by physical mechanisms, the above processes must somehow have produced powerful new virtual machinery long before human engineers discovered the need for such things (in the 20th Century). One of the consequences of the construction kit idea is that the kinds of mathematics required for fundamental physical theories and production of new physically testable predictions may not suffice for describing features, products, and behaviours arising out of new derived construction kits: this is already evident in the mathematical differences between notations of fundamental physics and notations found useful for describing complex chemical processes in which structures and processes change. A complex molecule like haemoglobin or DNA is not usefully describable merely in terms of a collection of numerical measures. There are similar changes in kinds of mathematics required for describing parts of meccano sets and those required for describing increasingly complex meccano constructions, in which new kinds of constraint on relative motion emerge. E.g. one perforated strip is rigid. If two rigid strips are joined by a single screw (with nut left loose) going through a pair of end holes, a flexible structure emerges, with a changeable angle between the strips. Adding another strip and screw produces yet another kind of structural flexibility since there are two angles that can vary independently. Joining the two remaining free ends with a screw removes all that flexibility: the shape is fixed -- an important discovery in Euclidean geometry. That rigidity could be an important aspect of the kind of constrained flexibility of a larger structure containing the triangle, as any mechanical engineer will know. Likewise there are many information structures required for coping with complex environments that instead of the mathematics of arithmetic, calculus, probability and statistics need the mathematics of topology, grammars, semantic contents, logical relationships -- and probably kinds of mathematics not yet discovered. Some examples have already been discovered by engineers whose products have multiple stable and unstable states with different energy relationships and different sorts of constraints on trajectories between states. Natural selection made many such discoveries long before humans did. It is remarkable that the FCK had multi-layer self-extending capabilities able to produce physical and virtual machines with information processing capabilities that eventually generated questions about the nature of the universe and its ability to produce life. But many of the intermediate stages and parallel branches are equally remarkable. Without a theory of the powers of the fundamental construction kit, supplemented with many theories about the derived construction kits that the FCK is able to support, the theory of evolution by natural selection is based on an unfulfilled promise of explanatory power. IN OTHER WORDS: Without a detailed theory of the FCK and the many sorts of DCKs produced from it by combinations of natural selection and physical/cosmic accidents, the theory of evolution by natural selection is something like a story about the many travels of a vehicle that never mentions the engine of the vehicle. When we know a lot more about the FCK there will be many surprises -- none of which will require an intelligent designer however. The processes of evolution by natural selection have been compared with the work of a blind watchmaker. I prefer the comparison with a "blind mathematician" stumbling across theorems about possible products of the fundamental construction kit. The proofs of the theorems of possibility are the evolutionary trajectories leading to instances of those possibilities. But only some of the most sophisticated products of evolution have any hope of understanding the theorems or their proofs. We still have a long way to go. This document is a product of products of physical and evolved construction kits, including social/cultural construction kits. All of this raises questions about whether the current forms of mathematics used by physicists have rich enough generative power to explain the generative power of the FCK, a type of question raised in the context of reproductive mechanisms by Schrödinger (1944). Compare the challenge posed by a Physics Nobel laureate Anderson (1972). I suspect our educational system needs to include far more varieties of mathematics, including the recently much neglected mathematics in Euclid's Elements (published about 2,500 years ago, and arguably the single most important publication on this planet). The new educational system will also need to include an introduction to the variety of forms of virtual machinery, their mathematical properties, and their causal powers. I don't mean only virtual machines implementable on Turing machines or digital computers. In November 2014, while writing notes for talks in Edinburgh and Turin, I realised that a central idea in this project must be the idea of a "construction kit", explored in a sub-project introduced in Sloman(C-K). Evolution initially uses the "Fundamental" Construction Kit (FCK) provided by Physics/Chemistry, but repeatedly extends the scope of natural selection by producing ever more complex and powerful "Derived" Construction Kits (DCKs). Some of the DCKs are concrete (physical), some are abstract, and some are a mixture: hybrid construction kits. The processes also require scaffolding: use of temporary constructs. Many of the later construction kits are concerned with production of virtual machinery: about which human engineers have learnt a great deal since the 1950s, though the new knowledge has been largely ignored by philosophers (and neuroscientists? ), and the philosophical, psychological, and biological implications have been ignored by most computer scientists, biologists, psychologists, and engineers. This is a very unfortunate communication gap (not being addressed by the new wave of enthusiasm for teaching computing to children -- a missed opportunity, which may have to wait for a new generation of computing teachers with broader interests and backgrounds). Virtual Machine Functionalism (VMF): The only form of functionalism worth taking seriously in Philosophy of Mind and theories of Consciousness. Some implications for the study of consciousness are discussed in Sloman and Chrisley 2003. Construction kits intrinsically have mathematical properties: their generative powers and their constraints/limitations. That's why, to a large extent, it is easy to recognize and distinguish novel objects produced using a Meccano kit, a Lego kit, or a Tinker-toy kit. Because the generative powers, in most cases, are recursive or iterative, in the sense that constructed products of a kit can always be extended using that kit, and all the products of a kit are constrained by properties of the kit, the processes of evolution are deeply mathematical. However, when products of a construction kit CK interact with things that are not solely products of CK, the resulting processes can have features that are not derivable from properties of CK. The theorems of evolution (the blind mathematician) are primarily theorems about what is possible including construction kits and their products. The proofs of the theorems are implicit in the evolutionary and developmental trails leading to instances of the possibilities. Evolution also uses theorems about what is impossible: constraints on possibilities, i.e. necessities. But these do not have proofs produced directly by evolution, until some of the late products of evolution begin to notice them, think about them, reason about them, and communicate the results of such processes. All this is part of a long and complex story that may not become clear for many years. Although the products of evolution are fully implemented in physical mechanisms, accurate descriptions of the powers and actions of some of the new virtual machines require use of an ontology that is not definable in terms of the ontology of physics (e.g. concepts of winning, losing, attacking, defending, noticing a threat, trying to construct a defence). It follows that some of the properties of the virtual machines, and descriptions of some of their states, cannot be derived logically (or mathematically) from descriptions of the underlying physical machines. That non-derivability is consistent with full implementability. This is the variety of anti-reductionism proposed in Sloman (1978, revised). It is also one of the main themes of the theory of Virtual Machine Functionalism (VMF) mentioned above. In contrast with the majority of evolutionary research (that I know of), this project focuses on changes in types of information and types of information-processing in evolution. Those changes produce changes in the roles of information in control, reproduction, development, discovery, learning, communication, coordination and other processes, in living things of all sorts. But the examples keep changing, and becoming increasingly complicated, as a result of evolution. I am not sure whether there is any well-defined upper bound to the complexity, though if there is one it is likely to be far beyond the types of complexity found so far on earth. I shall not discuss the implications of that except to note that there's no reason to believe evolution of information processing has stopped, or is close to stopping, not least because changes in physical designs for organisms, i.e. genomes, are not required for evolutionary changes in information processing: as shown by cultural evolution, including evolution of art and science, and most recently the internet and related technologies. Is virtually unending change in information processing an inevitable consequence of the existence of the universe? I don't know. It would not happen in empty space. It would not happen on a planet derived only from grains of sand. If a planet, or solar system, or galaxy, or universe has enough diverse chemical components and enough random influences, then perhaps the unending (frequent? infrequent?) initiation of processes of evolution, including various types of meta-morphogenesis, is inevitable -- though I don't know how constrained the set of possible evolutionary trajectories is. Not even natural selection can produce chemically impossible brain mechanisms! Perhaps, when we have a deeper understanding of the Fundamental Construction Kit provided by physics and chemistry and its role in biology, we'll be better able to discuss whether a different kind of universe might have support life in a comparable variety of forms. The components, relationships, and forms of composition of a construction kit (e.g. Meccano, Lego Bricks, plasticine, paper and scissors) together determine what entities can be constructed using the resources of the kit, how much they can vary. What sort of construction kit had to be available from the earliest stages of this planet, to support not only all the physical forms and behaviours of life forms evolved on this planet, but also all the forms of information-processing, not only the information-processing involved in reproduction and growth, but also all the later forms including science, art, mathematics, engineering, politics, religious superstition, ethical debates, etc? Tibor Ganti (2003) proposed a minimal set of chemical mechanisms for elementary reproducing life forms. I don't know whether he thought his "Chemoton" idea sufficient to account for all forms biological information processing. A more detailed discussion of construction-kits as explanations of biological possibilities was inserted here in November/December 2014: Sloman(C-K). A closely related topic is the role of explanations of possibilities in science, discussed briefly here: http://www.cs.bham.ac.uk/research/projects/cogaff/misc/explaining-possibility.html. A theory that explains possibilities may be deep science without being falsifiable. How can a cloud of cosmic dust give birth to a planet full of living things as diverse as life on Earth? Many have asked: what sorts of physical and chemical mechanisms could make various stages of evolution possible, or various stages in individual development (epigenesis) in various types of organism, group or ecosystem. -- What forms of information-processing (computation) and what information-processing mechanisms are required, to make the production and diversification of life forms possible? -- What features were required in the Fundamental construction kit (FCK) provided by physics and chemistry before life began, that supported all the subsequent extensions and applications produced by natural selection, using many Derived Construction Kits (DCKs) (discussed in more detail in Sloman(C-K)). -- How do the mechanisms, the forms of representation (encodings), and uses of information all evolve and develop and what new forms of life do they support, or in some cases interfere with? In short, what are the causal roles of information in living things, and how do the information contents and the causal roles change over time, in individuals (at sub-cellular levels upwards), in species, in groups and in larger systems? What information is, how many varieties there are, what can be done with it, what it can do, what mechanisms are required for these processes, are all complex questions discussed further below. An example: From dinosaurs to Birds (in another document). What mathematical possibilities and necessities enable, constrain and shape the options for natural selection, for epigenesis, for individual competences, for cultures, for ecosystems? What mathematical constraints? -- Topological, geometrical, physical, chemical, biological, computational, epistemological, linguistic, motivational? D'Arcy Thompson, Brian Goodwin, and researchers included in a book of tributes to Goodwin, focused mainly on geometric and topological changes and constraints in evolution and development of physical forms (though I have not yet read all the papers carefully). In contrast, the concerns of the M-M project include mathematical structures and constraints relevant to types of information content, forms of representation of information, modes of reasoning, types of control of behaviour, forms of learning, and other uses of information -- which are much less visible, and leave no fossil records. For these and other reasons, the study of M-M problems is still in its infancy. Far fewer researchers are equipped to think about these questions. At least physics, chemistry, and mathematics are taught to many children in schools. Perhaps nobody is equipped yet: if some key ideas have not yet been discovered? If Alan Turing had lived longer he could have taken this project much further than I can. If Immanuel Kant had known what we know about information processing machinery, he would also have put the ideas to deep use. There are probably many other thinkers that I have not yet encountered whose ideas are relevant. Some who have raised similar questions focus mainly on the evolution of human minds, e.g. Merlin Donald and Peter Gardenfors, among many others (including many I have not read). There also seem to be overlaps with the work of Stuart Kauffman. Jack Birner (2009) has discussed ideas of Popper and Hayek related to this project. Many of the writings of Daniel Dennett make points similar to the points made here, including his Kinds of Minds (1996), his writings on free will and others. However, we disagree regarding his claim of the centrality of "The intentional stance" for reference to mental states and processes, and his denial of the existence of the entities variously referred to as "sense-data" or "qualia", which I have argued arise naturally in sufficiently complex virtual machine architectures (e.g. in Sloman and Chrisley 2003 and the discussion of Virtual Machine Functionalism(VMF) above). Daniel Dennett and I also seem to disagree on the origins of language -- which I argue must first have evolved for internal uses (with structural variability and compositional semantics, though not necessarily a "linear format"), to meet requirements for information processing within organisms, not communication between organisms. What are the functions of vision? How did human language evolve? His more recent "constructor theory" overlaps partly with the theory of construction kits under development here, but seems mainly to be focused on the bottom level: the fundamental construction kit, whereas this project emphasises multiple layers of derived construction kits mentioned above. Nevertheless, the book includes many interesting remarks about what needs to be explained. Iain Styles drew my attention to a very short but influential paper by the Nobel-prize winning physicist Philip Warren Anderson "More is different" in Science 1972 available on JSTOR, suggesting that there are many levels of organization between sub-atomic physics and the phenomena studied in other sciences, including biology and the social sciences. The suggestion that there are layers of construction kits of different sorts (proposed in Sloman(C-K)) appears to be supported by, or at least consistent with, his ideas. It surveys literature attempting to use ideas about dynamical systems to explain the emergence of mind, and argues that those ideas are inadequate to the task (a conclusion with which I agree, as explained in the paper on the roles of construction-kits in evolution). Is evolution more like a blind theorem prover than a blind watchmaker -- proving theorems about what is possible? Every time some new physical feature, behaviour, or mechanism arises in a living organism, that constitutes an implicit discovery that that sort of thing is possible, and was possible previously, though the realisation of the possibility may be more or less accessible at different stages of evolution. The evolutionary or developmental history contains an implicit proof that it is possible, but extracting the proof at the right level of abstraction may require sophisticated mathematical abilities that do not evolve till much later. The meta-cognitive ability to notice that such a discovery has been made did not evolve till very recently (resulting from a mixture of biological and cultural evolution, among other things). It requires a highly specialised form of information processing competence, apparently available only to humans, among species evolved so far. Yet evolution itself seems to have noticed some of them "implicitly", insofar as it discovered not only very particular solutions, but also generalised patterns that were then instantiated in diverse particular cases. The "laws of form" (studied by D'Arcy Thompson and others) illustrate this: A genome does not specify the precise shape and size of an organism or its parts, but rather a network of relationships between possibilities that can vary between individuals, but even more remarkably, can vary within each individual during that individual's growth and behavioural development (e.g. learning to control movements while size, shape, weight, weight distribution, needs and opportunities all change). Another example of evolution discovering and using a collection of powerful mathematical abstractions is use of a basic collection of learning abilities to bootstrap abilities to learn how to use increasingly sophisticated features of the prevailing language or languages: a system that was eventually able to work in several thousand different cultures using different languages. Moreover, the evolved mechanisms in humans somehow provide transitions between having various competences (possibly recently acquired) and becoming able to think about those competences and help others acquire them. Some of the ideas summarised in the above paragraphs are developed in connection with the Meta-Configured genome illustrated in Figure Meta-Config, below. Discussion of the blind theorem prover idea continues below. How do products of evolution combine with one another and with other environmental factors to form niches (sets of requirements) enabling and constraining future products of evolution (future designs partially matching the requirements) in multi-level dynamical systems constantly generating new dynamical systems, with new possible trajectories, and new feedback control mechanisms, in individuals, in social groups, in ecosystems, and now in multiple global villages? How can the genotype available to a newly born or hatched animal make possible hugely (infinitely?) varied developmental trajectories in different environments, e.g. squirrels in different gardens with (mostly) shared genomes learning to defeat new "squirrel-proof" bird-feeders, and humans learning any one (or more) of several thousand very different human languages, absorbing whatever culture the child grows up in, acquiring competences relevant to local geographical features, local fauna and flora, local sources of food, shelter and danger, personalities of local conspecifics, etc. and in some cases creatively extending those environments through new inventions, new discoveries, new works of art, new moral teachings, new mathematical proofs, etc. Even Turing (who should have known better?) toyed with that answer in his 1950 paper, though mainly in the context of a machine that learns to have text-based interactions. All the general purpose mechanisms I've heard proposed so far operate on compressing bit-strings, or symbol-streams, and don't seem to be capable of learning geometrical or topological facts or skills, including the competences of a squirrel, a weaver bird, or a mathematician studying properties of toroidal surfaces. Are known forms of computation rich enough to provide such a genotype, or are there still secrets to be uncovered in products of evolution? Is there something about chemistry that we have not yet understood? Only with the properties of chemistry do we seem to combine three features necessary for life from its earliest stages onwards: energy storage and transformation, mechanical and sensory structures that can act on the environment when appropriate, and mechanisms for storing, using, copying, and transforming information Schrödinger (1944), Ganti (2003). Chemistry builds brains, at least in their early stages of construction, though chemical mechanisms remain essential for many brain processes throughout life. Perhaps interacting molecules do much more than we know, long after they have constructed neural mechanisms, as some neuroscientists now suspect, e.g. Trettenbrein(2016). Have evolutionary and developmental processes produced biological machines that are intelligent enough to find the answers to these questions, or understand them if found? How? Can schools and universities provide the sort of education required for researchers and teachers in this project? The Meta-Morphogenesis project attempts to combine and extend Turing's ideas about morphogenesis and his earlier ideas about discrete computation, in the light of what we've learnt since 1952 from computer science, artificial intelligence, computer systems engineering, biology, neuroscience, linguistics, psychology, chemistry, physics, mathematics, and philosophy. Unfortunately, because of flaws in our current educational systems, most philosophers and scientists seem to be unaware of the deep significance of what we have learnt about many forms of virtual machinery. A vast amount of research has been and is being done on the production by natural selection of new physical and geometrical forms of organisms, of many sizes and types, and production of new behaviours (e.g. J. Maynard Smith and E. Szathmáry, (1995), (1999), and Pallen (2009), among many others mentioned on Gert Korthof's web site). The Meta-Morphogenesis (M-M or MM) project focuses instead on production of new types of biological information processing, including information-based control mechanisms, whether used for reproduction, growth, development, metabolism, perception, motor control, learning (including creation of new ontologies and new forms of representation), motive formation, planning, planned or unplanned behaviours, meta-cognition, communication, daydreaming, explaining, theory change, mathematical discovery, mathematical proofs, enjoying and producing art, or anything else. All new forms of computation that arise during evolution, development or interaction with other organisms are included. This requires use of a very general notion of "computation", or "information processing", that is not restricted to use of bit-based computers. The changes in information processing include (a) what is done (as indicated in the previous paragraph), (b) why it is done, e.g. what benefits, if any, result, (c) what the information used is about (e.g. what it refers to, which can include past, present, future, remote, and non-existent entities, events, etc.) and (d) how all that is done, which refers to types of: information bearer, mechanisms for analysing, transforming, constructing, comparing, storing, retrieving information bearers, types of information processing architecture, combining different forms of information processing in larger wholes, types of self-monitoring, self-modulation, self-repair, self-extension, types of competition, types of conflict resolution, types of interrupt mechanism, use of virtual machinery, including multi-layer machines, distributed information-processing (involving several different individuals, or a whole community) and many more. As explained below, the ability of natural selection to be a sort of "blind mathematician", discovering and using mathematical structures, seems to be crucial -- refuting philosophical claims that mathematics is a human creation. .... Because the changes produced by the mechanisms of development and change include modified mechanisms for producing new changes in the mechanisms producing development and change. Natural selection (or the biosphere) is a bit like a young child that has begun to learn, but has no idea that it is learning, what it is learning, how it is learning, why it is learning, what it will do with what it has learnt, why what it has learnt works and why what it has learnt sometimes proves inadequate, either for individuals or for whole species. A difference is that over billions of years natural selection modifies its information-processing abilities far more than any child can do in a human lifetime, and modifies them in parallel in different ways. Moreover, at least on one planet, it has recently produced some individuals that have begun to understand some of what the evolutionary mechanisms produce without understanding. The reproductive mechanisms do not normally produce ready-made full understanders, but individuals empowered to grow their understanding guided by the environment and by what some of their forebears and peers have already understood. Some of those evolutionary changes bear a high level resemblance to processes in individual development in animals described as "Representational Redescription" in Karmiloff-Smith(1992). In particular, it seems that increases in competence both in evolution and in individual development involve mechanisms that partition discoveries into domains with mathematical structures that can be discovered by appropriate domain-related mechanisms (not merely the use of universally applicable statistical learning techniques as some have supposed). See also the quote from McCarthy below, and The Meta-Configured Genome discussed below. The key idea: evolution changes evolutionary processes and mechanisms, development changes developmental processes and mechanisms, individual learning changes individual learning processes and mechanisms, cultural evolution changes cultural evolutionary processes and mechanisms. Each of those is an example of meta-morphogenesis. Moreover, each of these processes and mechanisms of change can impact on the others, over appropriate time-scales. That includes changing what evolution can do, by changing the resources available to natural selection -- e.g. by creating, modifying, and combining construction-kits available for evolution, development, learning and social/cultural processes Sloman(C-K). social/cultural change is not a uniform process. Natural selection may seem to be a uniform process, but what it does depends both on the mechanisms generating options between which selections can be made, and the selection mechanisms, which in turn depend partly on external constraints and opportunities -- niches. The points summarised above imply that both the types of option and the selection mechanisms can change dramatically. changes in the ways all these processes influence one another. One of the most important discoveries of biological evolution was the power of "generative" forms of representation of information: e.g. encoding information using trees and networks of information, whose nodes can be either arbitrary non-decomposable objects, or structured (decomposable) objects composed of other objects, for example trees and networks whose nodes contain trees and networks. The need for such meaning structures is clear in connection with the contents of complex sentences, pictures and diagrams, with parts that have parts that have parts. The need also exists in percepts, in mathematical formulae and proofs, in complex intentions, in explanatory theories, and in action plans. This is not intended to be a complete list of information processing novelties produced by natural selection. Extending the list, filling in details, and testing ideas by empirical research into processes and products of evolution, building working models to check the feasibility of the theories, and addressing a variety of closely related philosophical problems, including problems about relations between mind and body, are all among the long term aims of the M-M project -- potentially a huge, long term project. Achieving such goals will require, among other things, major advances in AI and robotics in order to be able to test theories of how organisms work, and may even require novel forms of physical computing machinery, for instance if some of the functions of chemical information processing, with their mixtures of continuous and discrete changes, cannot be replicated in digital computers; and new kinds of mathematics may be required, for reasoning about how some of the systems work. In the process we can expect many old philosophical problems to be solved or dissolved and many new ones to emerge. Although the processes start off "blind", the achievements are of a kind that would require highly creative processes of design, implementation, testing, development, debugging, and re-design, if produced by human engineers. In some of the later stages, when animal cognition begins to play a role in evolution, this is a form of conscious, but not yet self-conscious, creativity. Similar remarks can be made about varieties of creativity in development of individuals, discussed further in connection with "toddler theorems". I suspect there's much still to be learnt about the varying challenges and opportunities faced by microbes at various stages in their evolution, including new challenges produced by environmental changes and new opportunities (e.g. for control) produced by previous evolved features and competences -- and the mechanisms that evolved in response to those challenges and opportunities. Example: which organisms were first able to learn about an enduring spatial configuration of resources, obstacles and dangers, only a tiny fragment of which can be sensed at any one time? What changes occurred to meet that need? Some researchers, including (as I understand him) Juergen Schmidhuber, (2014) seem to regard the pinnacle of evolutionary design as a totally general, domain-independent learning mechanism, which allows individuals to learn in any environment by discovering statistical relationships between sensory inputs and motor outputs; whereas there seems to be plenty of evidence that humans have different kinds of learning capabilities, used at different stages of development or for different domains of structures and processes. Ulric Neisser wrote in Cognition and Reality, W.H. Freeman, 1976. "... we may have been lavishing too much effort on hypothetical models of the mind and not enough on analyzing the environment that the mind has been shaped to meet." "Evolution solved a different problem than that of starting a baby with no a priori assumptions." McCarthy's suggestion is consistent with the hypothesis that natural selection produced a variety of different learning mechanisms useful for different stages of development in complex organisms, as depicted below. (including an introduction to the idea of a "Domain"). "Alan Turing: His Work and Impact". Detailed list of contents and contributors. After submitting my three promised papers I found that I was also expected to contribute to part IV (as a result of a misunderstanding). So I read Turing's 1952 paper on Morphogenesis Turing(1952), about which I previously had only very vague knowledge. Turing's paper is not an easy read, especially for non-mathematicians. A useful overview for non-mathematicians by Philip Ball is Ball, 2015. Accordingly, D'Arcy Thompson tried to relate morphology to physics, and to the dynamical processes involved in bodily growth. He suggested that very general physical (as opposed to specific chemical or genetic) constraints could interact to make some biological forms possible, or even necessary, while others are impossible. That is closely connected with the view of evolution as a "blind theorem prover", explained below. Reading Turing's 1952 paper knowing that he had died two years after its publication, led me to wonder what he might have done if he had lived longer. My tentative (presumptious?) answer was that he might have worked on filling gaps in our understanding of evolution of biological information processing mechanisms of many kinds, used in reproduction, development, perception, control of actions, learning, problem solving, etc. Newly evolved information processing mechanisms can alter the mechanisms of evolution (e.g. in mate selection) so I called this "The Meta-Morphogenesis Project". For the last few years of his life, Turing's energy went primarily into what he called "my mathematical theory of embryology". Indeed, after writing the first Manchester programming manual in 1950, he neglected his duties in the computing laboratory there as a result of his new interest. This is a complex, multi-faceted project, and could take several decades, or centuries (compare the history of physics, and chemistry). Some of the main ideas are elaborated on this web page, and in other web pages referred to on a separate page. At present everything is provisional. The ideas have reorganised themselves several times since the first paper was written. Perhaps the most significant revision came from dawning realisation late in 2014 of the importance for evolution of fundamental and derived (including evolved) construction kits Sloman(C-K). The Key Question: How could all life, and products of life, on Earth come out of a cloud of cosmic dust that converged to form a planet? How can natural selection produce minds on a lifeless planet? A full understanding of our origins requires us to combine familiar ideas about natural selection with ideas unavailable to Darwin and Wallace, about evolution of information processing functions and mechanisms, since the simplest organisms in chemical soups billions of years ago. Many research fields can contribute, including: genetics, microbiology, ethology, developmental psychology, neuroscience, linguistics, anthropology, philosophy of science, philosophy of mind, computer science, Artificial Intelligence and robotics. The research requires us to raise new questions about what evolution achieved and how it did so, including questions about new forms of information, new uses for information, and new mechanisms for processing information. Doing that requires us to investigate new construction kits created, and then used, by processes of development, learning, and natural selection to support those developments. As remarked above, Graham Bell wrote: "Living complexity cannot be explained except through selection and does not require any other category of explanation whatsoever." Like Bell, many writers on evolution (including philosophers) seem not to notice that adequate explanations need to mention both selection mechanisms and enabling mechanisms, as I suspect Bell is aware. Without enabling mechanisms (referred to here as construction kits), selection processes will not have a supply of new working/viable options to choose from. In that case the selection mechanisms will no longer be able to select new viable options. Both the selection mechanisms and the enabling mechanisms can change during evolution (partly by influencing each other). As a result, we can think of the initial enabling mechanisms, provided by physics and chemistry, as a form of construction kit that natural selection eventually uses (blindly) to build new mechanisms forming an enriched construction kit. If this happens repeatedly (as has happened spectacularly with computing mechanisms in the last 60 years or so), then the most recently evolved biological construction kits may be unrecognisable to scientists who know only about the initial mechanisms. So the M-M project requires multi-disciplinary investigations of layers of evolved biological construction kits, some of which have helped to produce new construction kits for use by evolution. It does not bring out (or try to bring out) the full variety of types of explanation of evolutionary phenomena. E.g. Computer systems engineers have been discovering or inventing new types of information processing for over half a century -- especially new types of virtual machinery. It appears that biological evolution made use of a similar discovery very much earlier, for good reasons, some of them summarised above. Systems biologists are constantly discovering new biological types of informed control (information-based control). However, there may be types of biological enabling mechanisms (e.g. forms of chemical or biological computation) that we have not yet learnt about - and that may prevent us understanding some of the transitions in evolution, e.g. some changes in reasoning powers in our ancestors including changes from which we benefited. new evolutionary mechanisms, including new drivers of variation and new selection mechanisms. Point (e) involves 'recursion': evolutionary morphogenesis changes mechanisms of evolutionary morphogenesis -- hence the label 'meta-morphogenesis'. That theory (and diagram) referred to processes of development in an individual -- processes that change some of the mechanisms of later development in that individual. This should be a strong constraint on explanatory cosmological theories, so far ignored by most physicists. Paul Davies is an exception, though I don't think his account includes the "multi-layered" genome idea above. Annette Karmiloff-Smith's ideas about "Representational Redescription" are also relevant. The M-M project has begun to identify many changes in forms of biological information processing, including transitions in mechanisms of reproduction, mechanisms of learning and development, and inter-individual and inter-species forms of information-processing. Examples of distinct types of transition in biological information-processing are being collected here. An important under-studied transition is evolution of capabilities that led to proofs in Euclidean geometry long before modern mathematics, one of the most important extensions of human minds in the last few millennia. How did abilities to think philosophically evolve? Were the cognitive mechanisms unique to humans or did unnoticed subsets develop in other species? When will our robots begin to acquire these abilities? The questions raised in the M-M project require long term multi-disciplinary collaborative research, perhaps comparable in scale to the Human Genome project. The relevance to philosophy of mathematics is discussed in a related web page. The concept of "information used by organisms or machines or biological processes for various purposes" is central to this project. But it is not the concept unfortunately labelled "information" by the great Claude Shannon and his many admirers. He understood the differences between the two concepts of information, but too many researchers ignore them. In fact many researchers think his is the only concept of "information" we have, or the only one relevant to science and engineering. But there is a much older one, used in everyday life and in science and engineering. The older concept refers to information that has many causal roles, e.g. in evolution, in animal (including human) perception, learning, motivation, acting, interacting, thinking, asking, wondering, being puzzled, finding answers (etc.) Information of this sort is also used in processes of reproduction, though often in obscure, indirect ways. Jane Austen's concept of information (contrasted with Claude Shannon's). In particular, "information-processing" here does not refer only to bit manipulation, or symbol manipulation, the operation of computers, or the sending and receiving of messages: those are all special sub-cases. The kind of information we are talking about does not need a sender and a receiver every time there is a use of information. Acquiring information is finding out about something that the information refers to (or purports to refer to: it could be false information). Information contents used by an organism can come from many different sources outside or inside the organism, recently or in the past, or both, and can play different roles: in controlling actions, in controlling sensing, in asking, answering or thinking about questions, in intentions, instructions, multi-step branching plans, conditions for doing something, predictive or explanatory theories, and many more. All organisms, and many parts of organisms, including cells, use information -- and not just for reproduction. Information from external or internal sensors can turn on, turn off or modulate behaviour, which may be internal or external behaviour, or a mixture -- e.g. muscle contractions used for grasping something or for running. Working out a plan for achieving a goal uses information about the intended state of affairs to create a new complex information structure whose parts refer to possible actions, possible contents of perception, conditions for doing things, sources of missing information, and many more. In the simplest cases, information is acquired and used immediately, with no record kept. For example, many homeostatic mechanisms, and servo-control mechanisms, use one or more sensors that continually record internal or external physical states, and compare them with some desired or preferred state, while response mechanisms continuously alter their behaviour in accordance with the difference between a target state and the most recent record and the current record, both continually being overwritten -- in online information-based control. Biological information is of many kinds, with many types of complexity, using many kinds of mechanism, for many types of purpose or function. The earliest organisms must have been restricted to "online" mechanisms (e.g. using chemotaxis). One of the tasks of the M-M project is to investigate the variety types of "offline" use of information, including uses to refer to the past, to remote (currently unsensed) parts of the environment, to possible future states of affairs, and to possible past or remote entities, about which questions are raised and theories formulated. The variety of types of use of information may be far greater than any theory of information produced so far has proposed. Some of the deep questions are concerned with the extent of use of mathematical structures in many varieties of biological information processing, with many kinds and degrees of complexity. The "proofs" of discovered possibilities are implicit in evolutionary and/or developmental trajectories. These processes produce new forms of representation, new ontologies and information contents, new information-processing mechanisms, new sensory-motor morphologies, new forms of control, new forms of social interaction, new forms of creativity, ... and more. Some may even accelerate evolution. Mechanisms for producing or modifying such mechanisms, including these mechanisms (recursively). Examples of meta-morphogenesis include the evolution of evolvability, the evolution (across generation) of new mechanisms for development and learning and the development (within individuals) of new mechanisms of development and learning. Often the changes occur in parallel streams of mutual influence of different forms of change or development (e.g. "arms races"). "Mutual orchestration" can happen both in co-evolution, in co-development in different individuals and in co-development of different subsystems within an individual. forms of reasoning about what is possible and what is necessarily the case, which explains why mathematical interests and capabilities are biological phenomena. I suspect the idea of a "construction kit" referenced above unifies many of these ideas. BEYOND MODULARITY: The work of Annette Karmiloff-Smith (Reviewed informally in a separate document). Old and new proofs concerning the sum of interior angles of a triangle. Illustrating topological and semi-metrical reasoning in everyday life. What can and cannot be done with chained rubber bands. Do we need to understand all of these (and more?) in order to build artificial mathematical minds comparable to ancient mathematicians -- or human toddlers? A collection of familiar and unfamiliar examples, based partly on observation of pre-verbal children, partly on things I have read and conversations with friends and colleagues. Some of the examples illustrate portions of the process of information re-organisation (perhaps instances of what Karmiloff-Smith means by "Representational Redescription"? summarised in a partial survey of her work). Much of Piaget's work is also relevant, especially his last two books, on Possibility and Necessity. Some of these were written before I started using the label "Meta-Morphogenesis". http://www.cs.bham.ac.uk/research/projects/cogaff/10.html#1001 If Learning Maths Requires a Teacher, Where did the First Teachers Come From? http://www.cs.bham.ac.uk/research/projects/cogaff/talks/#talk7 7: When is seeing (possibly in your mind's eye) better than deducing, for reasoning? http://www.cs.bham.ac.uk/research/projects/cogaff/talks/#talk56 Talk 56: Could a Child Robot Grow Up To be A Mathematician And Philosopher? http://www.cs.bham.ac.uk/research/projects/cogaff/talks/#talk63 Talk 63: Kantian Philosophy of Mathematics and Young Robots Could a baby robot grow up to be a Mathematician and Philosopher? http://www.cs.bham.ac.uk/research/projects/cogaff/talks/#talk67 Talk 67: Why (and how) did biological evolution produce mathematicians? OR If learning mathematics requires a teacher, where did the first teachers come from? OR A New Approach to Philosophy of Mathematics: Design a young explorer, able to discover "toddler theorems"
http://www.cs.bham.ac.uk/research/projects/cogaff/talks/#talk79 Talk 79: If learning maths requires a teacher, where did the first teachers come from? Transitions can occur in parts of organisms, in whole organisms, within a species, in interacting groups of species, in societies, and in environments (though organisms are part of the environment for conspecifics and for others). A sample list of types of transition produced by biological mechanisms The mechanisms include evolution by natural selection, individual learning, cultural development and transmission, including changes in genomes as well as changes in factors affecting gene expression. Changes in mechanisms of learning, including extensions of empirical learning to include non-empirical, e.g. mathematical learning (making use of new meta-cognitive capabilities). Introduction of new virtual machines, new forms of representation, new ontologies, new architectures, new sources of motivation, new motivation processing mechanisms, and many more, based on new construction-kits. As new, more complex forms of evolution, development, learning, perceiving, reasoning, communicating, collaborating, technology, ... keep arising out of the interactions between things that existed previously, along with natural selection (possibly extended by non-natural selection! ), there is a never-ending stream (trickle? flood?) of extensions to the phenomena that science needs to explain. For example, it seems likely that at some stage our evolutionary ancestors lacked some of the mathematical abilities that now exist in humans. How those abilities evolved, what new things they make possible, how they make them possible, are all questions for science that would not necessarily have been thought of by scientists observing those ancestors who lacked our mathematical abilities. What sort of construction-kit must the physical universe have provided to make it possible for life, mind, ecosystems, cultures, etc. to evolve from a planet formed from a cloud of dust? This leads to the conjecture that the space of possible forms of information processing that need to be explained by science is at least as complex as the space of mathematical problems that arise in the arithmetic of natural numbers. And we know that that space has unending complexity. If all this is correct there could never be a time at which all scientific questions will have been answered, not even if all questions about the underlying physical/chemical mechanisms that make life possible have been answered. That would be analogous to having a set of axioms for number theory. One of the great discoveries of the twentieth century, due to Gödel and others, was the infinite supply of unanswered mathematical questions that arise from the basics of arithmetic. Whether only a finite subset of the questions are worth answering looks unlikely. Combinations of Ei, Bi, Bj, ... cause changes in Bk, BL, .... etc., etc. -- e.g. organisms that can discover what they have learnt. -- organisms that make and use mathematical discoveries. In particular, most forms of biological information processing that exist now are products of parallel trajectories of biological information processing over many stages of evolution and development, including cultural evolution in the case of humans. This is quite unlike use of evolutionary computation (GA, GP, etc.) with a fixed evaluation function, often used to solve engineering problems. For example, evaluation in natural evolution keeps changing, as environments, including competitors, prey, symbionts, diseases, etc. change. Offers of collaboration welcome. I have no funds for this research, and do not intend to apply for funds. Others may do so. Later thinkers on that topic include D'Arcy Thompson, Brian Goodwin and Alan Turing (The chemical basis of morphogenesis(1952)). The main thing added by the Meta-Morphogenesis project is investigation of evolution of information processing, and the evolved mechanisms and construction-kits for biological information processing. A special case is evolution of mechanisms concerned with mathematical information and its uses (including geometry and topology not just information about magnitudes). In the mid 1980s, after apparently becoming dissatisfied with the state of AI, Brooks wrote a series of very influential papers that recommended a 'layered' approach to AI design, namely build systems that have relatively simple capabilities and then add new more sophisticated capabilities, that run in parallel with and make use of the older capabilities. He also related this to suggestions about biological evolution and the relative information-processing complexity of evolutionarily very old organisms, suggesting that what was added more recently to provide human functionality added relatively little. His ideas overlap with (and probably helped to influence) those presented in this project, but there are also deep differences. E.g. I don't claim that we can start building simple organisms with our current technology that provide suitable old, 'lower level' layers on which to add newer, more sophisticated, layers of competence. I am, however, suggesting that what is old in the evolutionary history of existing organisms may have many unobvious features that the M-M project should attempt to uncover. I also don't propose that it will suffice to start from multi-cellular organisms like insects, that have already evolved capacities to move around in rich and complex environments, foraging, feeding, mating, building nests, etc. Instead I consider the possibility that even at the single-celled level there may have been forms of information processing that underpin some of the types of information processing that interest us in humans and other animals. Brooks' suggestion that the importance of internal representations has been over-rated because the best representation of the world is the world itself, has been highly influential, but is at most relevant to what I've called 'online intelligence' involved in control of movements and manipulations using feedback mechanisms of various sorts. (H.A.Simon made similar points.) For deliberative and meta-semantic competences the slogan is not merely wrong: it has been positively harmful. Also the ideas in the CogAff project and the CogAff architecture schema allow for a richer variety of types of architecture than the type of layered subsumption architecture proposed by Brooks, though it's possible that each could be modified to cover more of the features of the other. His work had enormous influence in many research and teaching centres. Unfortunately the people influenced were often much less intelligent and less subtle than Brooks, and as a result much of the influence has been bad. Hence my critique. Margaret Boden's work mentioned in another file. S. B. Cooper and J. van Leeuwen, (Eds) (2013) Alan Turing - His Work and Impact, Elsevier, Amsterdam. This is a 2016 "snapshot" of the still growing next item. Aaron Sloman and Jackie Chappell (2017), "The Meta-configured genome (or universe)" incomplete draft discussion note, extending/generalising ideas in Chappell and Sloman(2007). Also reprinted in Alan Turing: His work and impact Elsevier 2013. Phil. Trans. R. Soc. London B 237, 237, pp. 37--72. John von Neumann, 1958 The Computer and the Brain (Silliman Memorial Lectures), Yale University Press. 3rd Edition, with Foreword by Ray Kurzweill. Originally published 1958. An incomplete, growing, collection of references to related work, including related research-projects, is available here. This is one of a set of documents on the meta-morphogenesis project. This work including all related web pages in the CogAff web site http://www.cs.bham.ac.uk/research/projects/cogaff/ CogAff web site is licensed under a Creative Commons Attribution-ShareAlike 4.0 International License. This declaration supersedes any referring to earlier versions of the Creative Commons License. Original version installed: 19 Oct 2011 now here. 28 Feb 2018: Added first draft new high level list of themes and hypotheses. 3 Jun 2017: Referenced metamorphology(Above). Nov 2016 - Jan 2017 Re-wrote introduction, distinguishing Q.1, Q.2, Q.3. Added references. 27 Oct 2016: Extended the analogy of evolution as blind mathematician by characterising the relations between the fundamental construction kit and all derived construction kit as closely analogous to proposed relationships between foundations of mathematics and all derived kinds of mathematics. Jan-March 2015: added separate pages on construction-kits, and explanations of possibilities. 19 Dec 2014: added reference to initial construction kit in introduction. Added link to related projects in this file. 8 Nov 2014: added link to new paper on entropy and evolution. 27 Oct 2014: Added a bit at the top about origins of this project. Slightly reorganised and extended various portions. 14 Sep 2014: New experimental top section. Is it too confusing? Does it sound like clap-trap to the uninitiated? 8 Sep 2014: slight rearrangement. Some new references. 24-5 Aug 2014: considerable reorganisation, with most references moved to here.